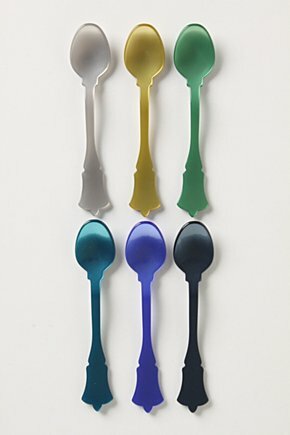 I was checking out the Anthropologie website the other day and came across these Six Sister Spoons. This colorful set of six teaspoons are made from laser-cut acrylic. Aren't they just so pretty? I think they'd look really cute mounted in a shadow box-type frame -- wall art for the kitchen or dining room. Just a thought.